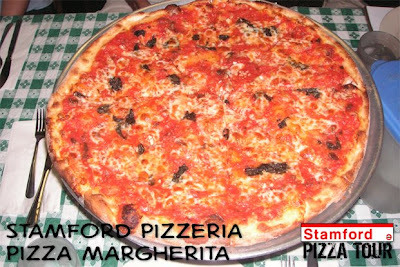 Stamford Pizzeria was kind enough to send two pies our way, a traditional Margarita pizza (pizza Margherita) with peeled plum tomatoes, fresh basil, garlic, and both Romano and light mozzarella cheeses as well as one topped with DeYulio's sausage and sliced onions, both on a thick, crispy crust. Reaves: "Excellent crust, not too thin; great cheese, excellent sauce." Kait: "Good sauce, the basil is a little 'meh,' kind of greasy." Elliot: "Crust is perfectly crispy, cooked to perfection"
Allison: "Nothing outstanding, good sausage, though"
Scott: "Very thick and crispy crust, was put off by cooked, wilted basil." Dan: "Good pizza, of course. Liked the sausage and onion better than the margarita." We were probably split down the middle on which of the two pies were better, but all things considered, they were both top notch and cooked perfectly with just the right amount of crispness and bite. 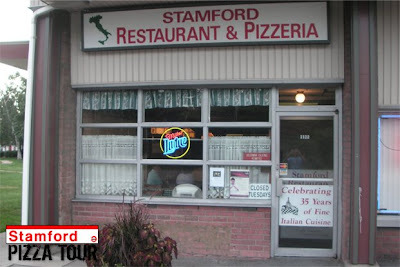 Everyone at Stamford Pizzeria was extraordinarily generous and welcoming as well, making for a rather enjoyable dining experience.